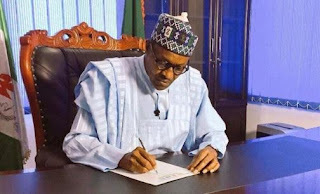 President of the Federal Republic of Nigeria, President Muhammad Buhari has today signed the Federal Competition and Consumer Protection Bill into law. The bill which was sponsored by the Senator representing the Anambra South Senatorial District, Senator Andy Emmanuel Uba is meant to promote economic efficiency, maintain competitiveness in the Nigerian market and protect the welfare of consumers. The statement reads: “His Excellency, President Muhammadu Buhari has Assented to the Federal Competition and Consumer Protection Act, 2019. “This Act establishes the Federal Competition and Consumer Protection Commission as well as the Consumer Protection Tribunal to try violations. “The law is to promote economic efficiency, maintain a competitive market in the Nigerian economy, protect the Nigerian economy, protect the interest and welfare of consumers by providing consumers with wide variety of quality products at competitive prices as well as prohibit restrictive or unfair business practices in the Nigerian economy.